The company did not immediately respond to a request for comment sent through its website. The cellular phone of the company’s chief executive, Michael Mendez, had a recording on Thursday afternoon that said it could not accept calls. An Ottawa, Canada-based analyst of unusual ship and plane movements, Steffan Watkins, drew attention to the frequent flights of the 21 Air cargo plane in a series of tweets on Thursday, US time. That’s when the cargo plane began flying to destinations in Colombia and Venezuela on a daily basis, and sometimes multiple times a day, Watkins said. 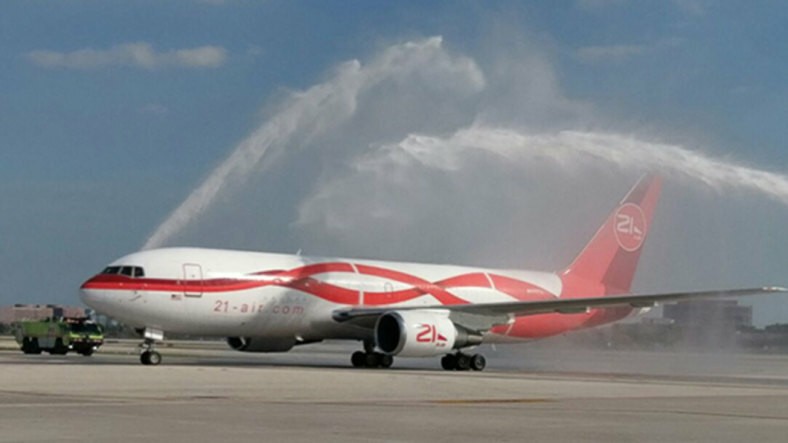 The plane has made close to 40 round-trip flights from Miami International Airport to Caracas and Valencia in Venezuela, and Bogota and Medellin in Colombia since January 11. The air cargo company’s website says that the Boeing 767 has a payload capacity of 42 tonnes. Venezuelan authorities displayed the weaponry that they said was delivered by the 21 Air cargo plane on open-air tables draped in red cloth. Some of the rifles included stands for long-range targeting. The shipment included 15 AR-15 assault weapons, a Micro Draco semiautomatic pistol with a jumbo magazine, a Colt 7.62 rifle and two telescopic sights, the governor’s statement said. Flight records from the tracking site flightradar24.com, monitored by Watkins, indicate that the 21 Air cargo plane flew at least four times to Valencia from Miami and another four times to Caracas from Miami since January 11. In many cases, the flights would head on to Bogota or Medellin before returning to Miami. If some US entity were attempting to provide arms to a Venezuelan resistance movement, it would be taking a familiar page from the history books. More than a decade later, Sandinista soldiers shot down a cargo plane taking weapons to the US-backed Contra rebels fighting the Nicaraguan government. A US. Marine veteran, Eugene Hasenfus, survived the 1986 crash, and later told reporters that he was working for the CIA, paving the way for his release and return to the United States. Curiously, one of the figures in the Reagan administration instrumental in delivering support to the contras, former assistant secretary of state Elliott Abrams, was named by US President Donald Trump late last month as his special envoy overseeing policy toward Venezuela. like in Syria, Libya, Nicaragua, etc. etc. etc. etc. etc. etc. etc. etc. etc. etc. etc. etc.